I have a collection of old containers that are missing the pour spout. Sadly I only have one spout I like and interchange with the others. I hate the anti spill spouts at least the ones at Lowes H DEPOT. Seems anti spill only type legal now. Do you know of a brand that is good? John Stossel had a segment on his show which explained the reason behind the retarded pour spouts we have available to us today. Long story short....lawyers made it happen. Kids tend to pour gas on fires just to see what happens. These new spouts, which are nearly impossible to use, are a result of lawsuits against gas can manufacturers. I'm not sure how much these new spouts will help prevent burns to idiots who play with gasoline and fire....at the same time.....but I do know that they make filling a small engine a real chore. My favorite.....an old military surplus Jerry Can with a flexible metal spout. I now use it to store fluids to be recycled. The simple spout I was lucky enough to have bought just days before the flawed EPA changeover to unusable spouts! Ventless without the darn antispill! Works much better. I know what you mean about it getting heavier as the years go by! I no longer keep them filled to the top. 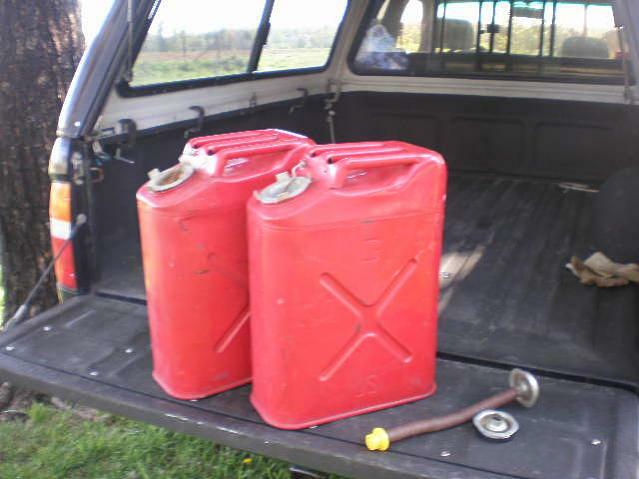 I keep two Jerry Cans on hand, but only put about 3 gallons in the one I use for the log splitter. After filling it, I'll steal some fuel from that can when I mix up the 2-stroke fuel for the chainsaws. The other can is clearly marked for diesel. I use it to fuel my truck or tractor in a pinch. The fuel in these cans is always fresh, as I empty them just before I make a trip to town to fill the truck. I'll then top off the cans at the same time. For the chainsaws, I have a handy little 1/2 gallon can that works great. I like it because it's easy to pour from, and lasts through my noon break, when I'll mix up another batch of 2-stroke gas/oil to get me through the day. The simple spout I was lucky enough to have bought just days before the flawed EVA changeover to unusable spouts! I took the guts out of my new spout a couple of weeks ago. Pours fine but at least mine was two parts and now leaks where joined. Was just pushed together. Guess I need to glue it. I stopped using pour spouts years ago. Too much hassle and spillage. I took a drill to the little flat stopper and made a hole just big enough to accept one end of a good long piece of clear tubing. Stuck the tubing through the hole far enough that it can reach the corners of the opposite side when it's in the neck of the Jerry can and applied a generous amount of RTV to both sides to seal it in place. Next a bit of a weight on the short end of the tube to keep it laying on the bottom of the Jerry can. 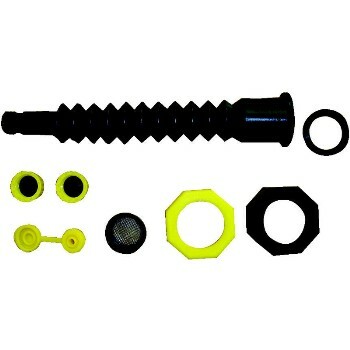 Then drill a hole in the small vent cap to accept a Schrader valve or other air fitting of your choice. When done, drop the tube into a full Jerry can, install the lock ring down over it and tighten. Put the new cap on the vent and tighten. 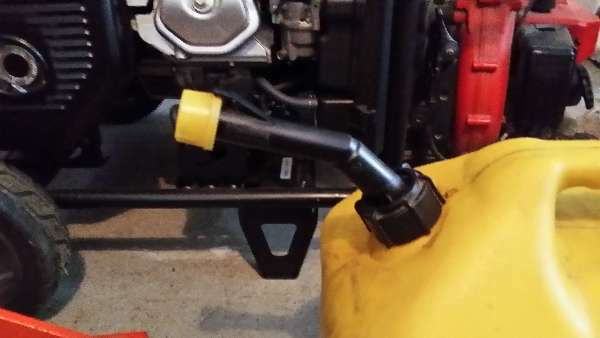 Now you can either; lift the Jerry can onto the hood of the tractor and just tip it over and back to start the fuel siphoning, or set the Jerry can near the tractor or on a front tire and apply a little air pressure to the vent side and use the trapped air pressure to 'pump' the fuel up into the tank. Murf- Thanks for the idea...those cans sure are getting heavier each year.. 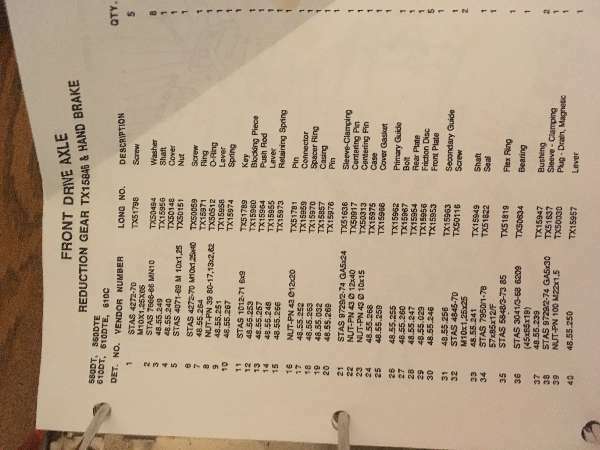 I too have been frusrated with the ""new improved"" fill spouts/cans I'd given up trying to find any to my liking... Just so happened my neighbors were moving to their Northern Michigan place (more family up there for them) and they called me and mentioned come on over before we advertize the yard/moving sale if there would be of anything I'd want and yep found two old style plastic fuel cans one diesel and the other had kerosene but was bone dry just the cap missing on the spouts. both in good condition and no crud in them got them both for under $5. Found a couple plastic pipe plugs in my misc junk/nuts/ bolt bucket that fit the top of spouts. Here is a universal spout kit that is the only thing I could find when the original spouts on my plastic cans broke. These are not as good as the originals I replaced but they beat buying new cans with the stupid anti-spill caps.